What an appropriate title! It feels like you’re starting life over. Any knowledge and educational degrees you’ve acquired over the last thirty years seem null and void. Things are very different than what you read in those books. Those books about what to expect when you are expecting and now you are expecting to have no idea what to expect. I know you dream of easier days and nights full of quiet, continuous sleep and feel guilty about wishing the days away. I know it seems like time is ticking slowly by and it feels like you are stuck in the movie “Groundhog Day.” The one where Bill Murray finds himself trapped in a time warp and he keeps waking up to live the same day over and over again. Except in your time warp, the day revolves around a baby- Baby cries, pick up baby, soothe baby, check diaper, change diaper, feed baby (for like hours), baby sleeps, you should sleep, baby cries and repeat. Repeat over and over again, every 3 hours or on demand, for what seems like every future day. I know you wonder if you will live life at some sort of a predictable, “normal” rhythm EVER again. I know it feels like you have completely lost yourself and wonder if you will ever find yourself again. I know you’re anxious, hesitant and constantly questioning yourself as you weed through a tremendous amount of information and opinions and try to make a variety of good decisions on behalf of your sweet baby. Very kindhearted people with good intentions offer you advice but since you are so overtired, oversensitive, and overwhelmed you cannot appreciate their wisdom. Or maybe more than that, some of their advice makes you feel like you are doing it all wrong or even worse, it’s a reminder that you are not enough. And even though you are surrounded by people, I know you feel very alone. Ten years later, I can tell you the hospital did not make a mistake. It may have been a rocky start at home adjusting to everything new but no mistake was made. God picked you to be your baby’s mother. He knows you can do it, gives you everything you need, and you can rest in that. Hold onto that truth and embrace it during the long days and nights. Repeat it constantly to yourself and especially when the hospital sends you home two more times, with two more babies. Your life has started over but in a new and beautiful way. Those degrees you acquired in school will be used again but the type of degree you are working on now does not come from schoolwork but lifework. This is a never ending study in unconditional love. It requires time, patience, mistakes, forgiveness, grace, sacrifice and it changes everything. Through the lens of love, relationships and the world will look different. You will begin to understand the sacrifices your mom made for you and what it means to be loved by Jesus in a way that brings you to tears almost every time you think of it. And as far as the what to expect, you will never know what to expect because each day, each baby, brings new challenges and blessings. It’s a constant practice trying to be content and present in the very moment. Oh, and just when you think you have something figured out, it all will change. So, expect the unexpected and expect love. The days will get easier, you will get more sleep and sleep is awesome. Easier is relative though. In some ways it will be easier and in others ways more difficult. The cliche is true! Time goes by quickly, much more quickly than you ever thought it could. One day, instead of wishing the days away, you’ll wish they would stay. (Maybe the trade off for sleep is fast moving time?) Your life will find a predictable rhythm again but every season will have a different rhythm. And you’ll love the changing rhythms because you do not like boring, and motherhood is far from boring. About the anxiety and sad feelings, it was a good decision talking with the doctor. What you see as an extra burden now, God will heal through medicine and faith and use this in ways to empathize with other moms and others dealing anxiety and depression. You will always have the threat of doubts and fears but you will persevere and overcome them with confidence in His strength. You will need to work on your “perfectionist” tendencies though and embrace the imperfections and the mistakes because those will make you better not worse. BTW, you are not enough. At least, not enough on your own. You need Jesus and community more than ever before. Let down the walls. Let others in. Ask for help. Don’t try to do life alone. 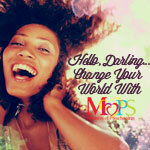 One of the greatest communities you will find will be in a MOPS group. You’ll find friends, faith, and freedom there. MOPS will encourage and equip you to be the best mother, woman, and leader you can be. It will help you find purpose and give you opportunities to practice confidence in the next things that God is calling you to do. Make time for family and friends. Embrace your church family and the women in it. Their lives and experiences, their stories shared with you, are gifts. Gifts worth more than any amount of money can ever buy. You will see the importance of their words when you are not so overtired and overwhelmed, and you will come to crave being taken care of by them, tucked under their wings, and covered by their prayers. Your heart will swell a thousand times over when your babies are welcomed into these communities and loved by your friends too because we are better together. Shanna, you are doing a good job even when you think you are not. Take one moment at a time. Remember, the challenging moments are more valuable because they are richer in experience and make you stronger. And even though it’s good now, the best is yet to come. Motherhood is an amazing, special gift.